I inherited the administration of a WSUS environment, but I have some trouble understanding. Most of the computers have a “Warning”-symbol, and show that a number of updates are needed. So, as far as I understand these computers need some updates that I haven’t approved yet. Now, my question is: where can I see which updates exactly are needed, so I can approve the right ones? WSUS has a very old and clunky interface that is in desperate need of an update to the 21st century. Bear with me as you go through the process and begin to wonder if this is even worth it. 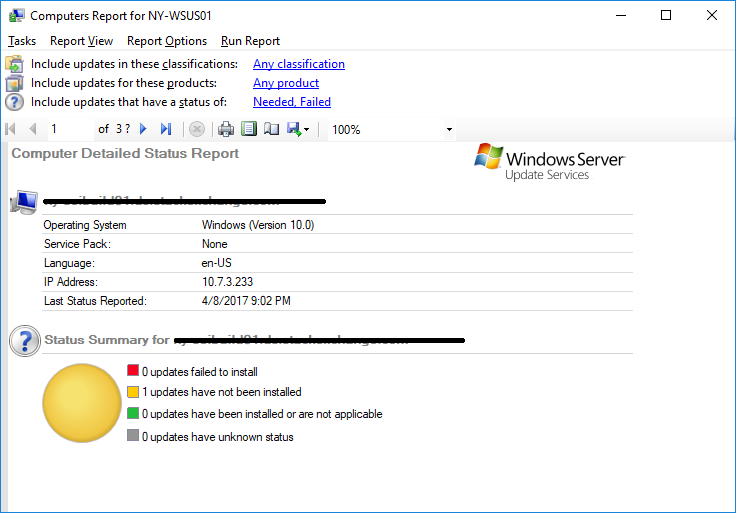 Right-click the computer(s) in question and choose "Status Report"
Then you will be presented with one of the most irritating features of WSUS. The report viewer. When you try to install the Report Viewer, you're likely going to get an error about a lack of a missing prerequisite. The fun thing about this update is that it's not actually easy to find, but you can get help for that here (includes a download link too!). Go on and install that. Still following? Ok go back and run that report viewer install again. Then restart your WSUS console. Get that Status Report again. Then you open the report and say "Uhh what? This isn't what I wanted, where is my list of updates?" At least there's one thing that works, and that is that you can click the hyperlinks in the "Approval" column and change the approval status from here. Not the answer you're looking for? Browse other questions tagged windows wsus windows-update windows-server-2016 or ask your own question.